1. Steam the cauliflower for 3-4 minutes until just tender. Drain really thoroughly and break into smaller florets. Cook the pasta in a large pan of boiling water for 4 minutes until al dente. 2. While the pasta is cooking, heat the olive oil in a medium frying pan and add the chorizo. Cook for several minutes until golden then add the drained cauliflower and toss in the pan juices. 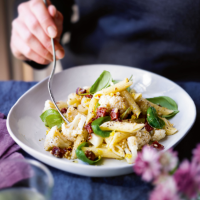 Drain the pasta and add to the frying pan with the lemon zest, hazelnuts, basil and grated cheese. Toss together to coat the pasta and season to taste. Serve in warm bowls with extra grated cheese and a drizzle of extra virgin olive oil if desired.